Cuban-born pianist Manuel Valera’s fusion of Latin music and jazz has attracted many fans and garnered much acclaim. It’s also seen the thirty-six year old musician share the stage or studio with musicians such as Arturo Sandoval, Jeff “Tain” Watts, John Patitucci and Chris Potter. 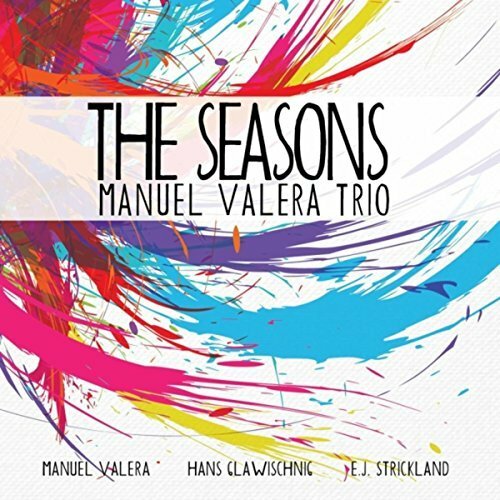 The Seasons is Valera’s twelfth recording as a leader and his second with this trio. The album mixes original compositions with covers (from The Beatles, Cole Porter, Leonard Cohen and Cuban composer Osvaldo Farres). The album ‘s first track, “The Opening,” is an energetic number which sees Valera alternate between playing fast, fluent runs, and extended vamps, over which Strickland’s drums crackle and fizzle. Valera’s influences are said to include Bill Evans, Keith Jarrett and Chic Corea, and while you can hear this, Valera stamps his own style on this album. Farres’ Tres Palabras is a beautiful ballad, highlighting Valera’s lightness of touch and the rhythm section’s sensitivity – they give the music plenty of space to breathe. The Beatles’ In My Life initially sticks to the song’s melody until the fourth minute, when the music opens out and starts swinging. The centrepiece of the album is a four-movement suite, The Seasons, inspired by Vivaldi’s Four Seasons, although bearing no relation to the classical piece in terms of form or content. “Spring” is a jaunty number, heralding the start of new life, while the second movement, “Summer,” is an eight-minute opus starting with a slow bass pulse and ending in a blistering climax, interspersed with solos from Glawischnig and Strickland. “Fall,” a number which rises and falls in intensity, evokes the images of slow falling leaves and shortening days, while “Winter” plays out the year with a gorgeous melody. The album finishes with a lively rendition of Cole Porter’s “What Is Thing Called Love,” (Strickland giving his drum kit a hard work-out), before ending with Leonard Cohen’s contemplative “Hallilujah.” The jazz trio market is a crowded one, but there is definitely room for one that is as talented and exciting as this one.